I also spent some time putting together another arabesque. I tried to do something similar to her coronet, but there is way more surface area on this so things didn't really match up. I kept the starry style arabesque since it let me work her badge into the design. Also, using that style let me do the whole design in straight lines, which makes for good engraving practice. 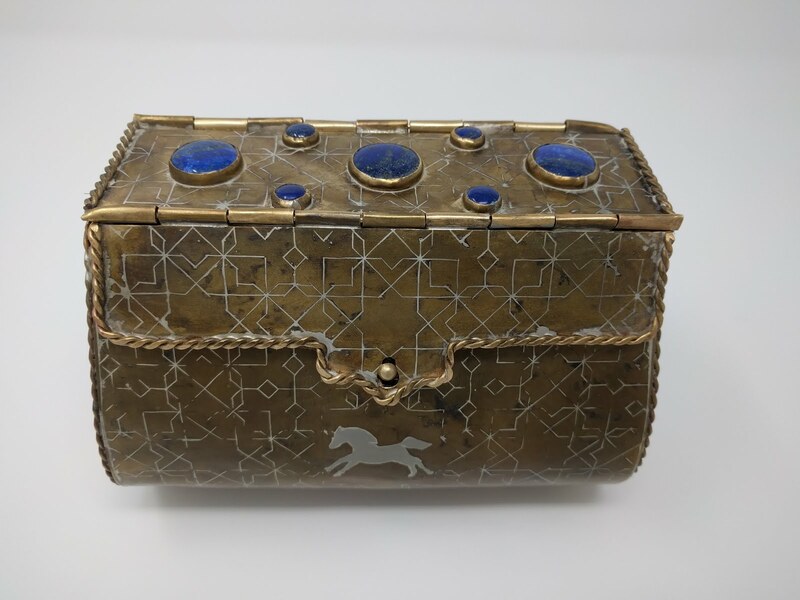 In the original piece, it looked like there was some kind of repousse set in the lid*. However, it looked far more complex than I was prepared to do (since I haven't touched chasing and repousse since college) so I decided to swap it out for some lapis cabs instead. *After finishing the piece and while writing my documentation, I learned the original piece is generally referred to as the Courtauld Bag, which turns up far more results than just hunting for a metal bag does. 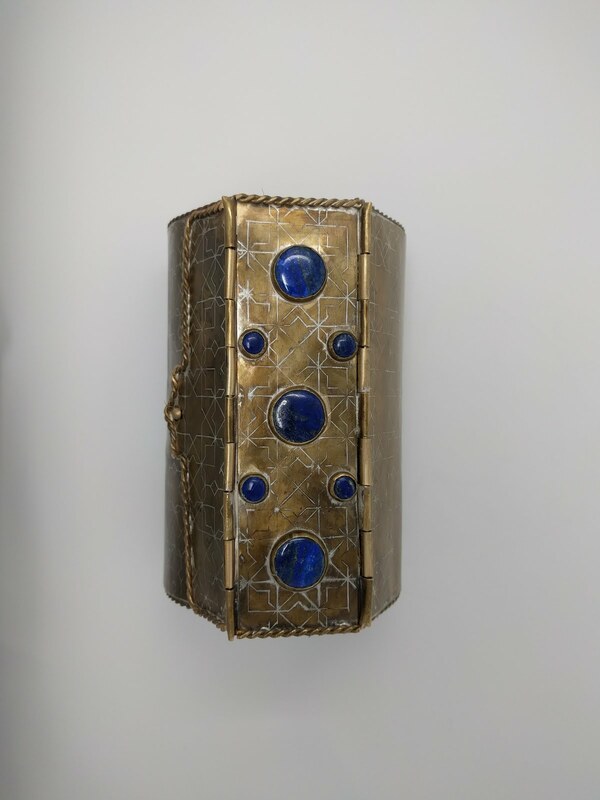 A video from the Courtauld Institite provides much more detail, and it looks like the top piece is actually more inlay. Still more complex than I wanted to get into, so I would have stuck with cabs regardless. Engraving all the panels took a majority of the time for this project. To start with, I learned a fun trick with laser printers. 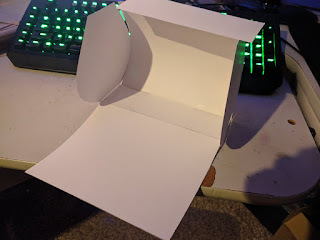 Instead of using toner transfer paper, if you print an image in reverse (not needed here though) on normal paper, you can lay it toner side down on the metal and rub acetone over the back with a paper towel. This will release the toner from the paper and adhere it to the metal. This helped get the designs across accurately, since I can't just glue the design down for engraving like I can when sawing. 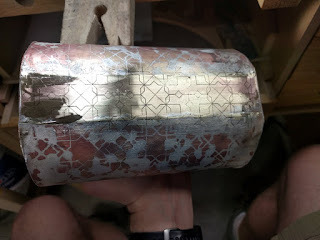 I started out using a V graver, which like it sounds, is shaped like a V. The style I used has a 105 degree angle out of the base. 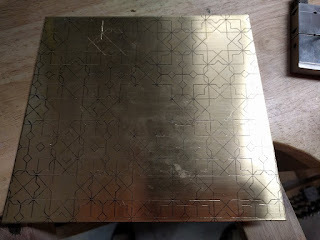 But, after engraving about a quarter of the first panel, I switched to a round graver for the rest because it will cut wider lines than the V does at the same depth. My plans included inlaying a horse in the large mullet in the middle of the panel. 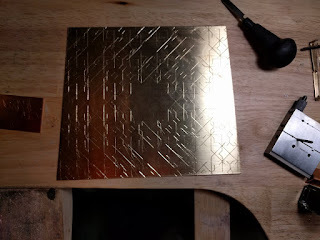 So, I got to drill a hole and cut the inlay in the middle of the thing I spent hours on while thinking "don't mess up, don't mess up, don't mess up." Since I needed two of these panels, I got to do the whole process again. Next were the side panels, made in a very similar way. I had a fun issue come here: Inkscape started refusing to print to my printer. So, I exported it as a pdf and printed that. But, the pdf had margins, so the sides were slightly smaller than I planned. Instead of the panels ending at the bottom edge of the curve, they wrapped around the edge so they would rest on the table a little. Unfortunately, I realized this after they were already engraved, so I filed down the sharp corner and went with it. It just meant the overall piece was slightly smaller than the original was. After each of these panels were engraved, the whole piece got coated in flux and silver solder was melted into the engraving. 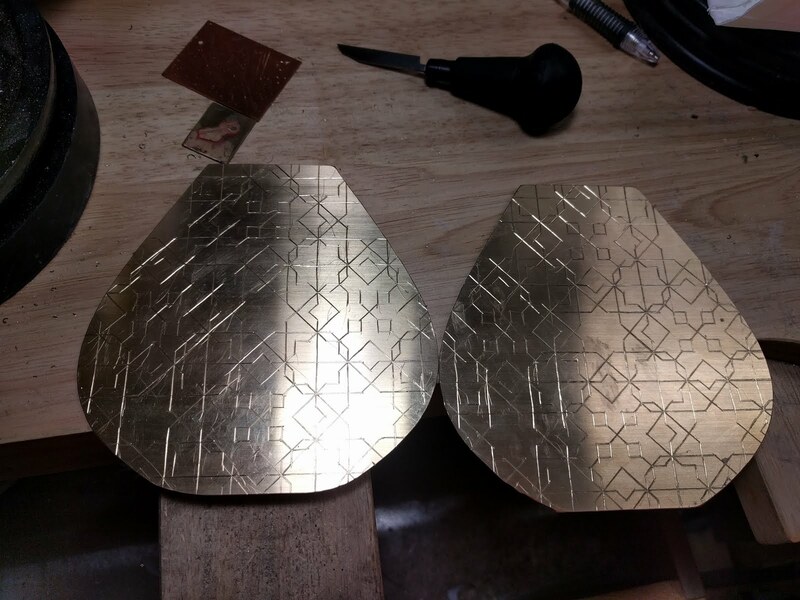 The front and back panels got bent into position over a forming mandrel and the sides got soldered into position. 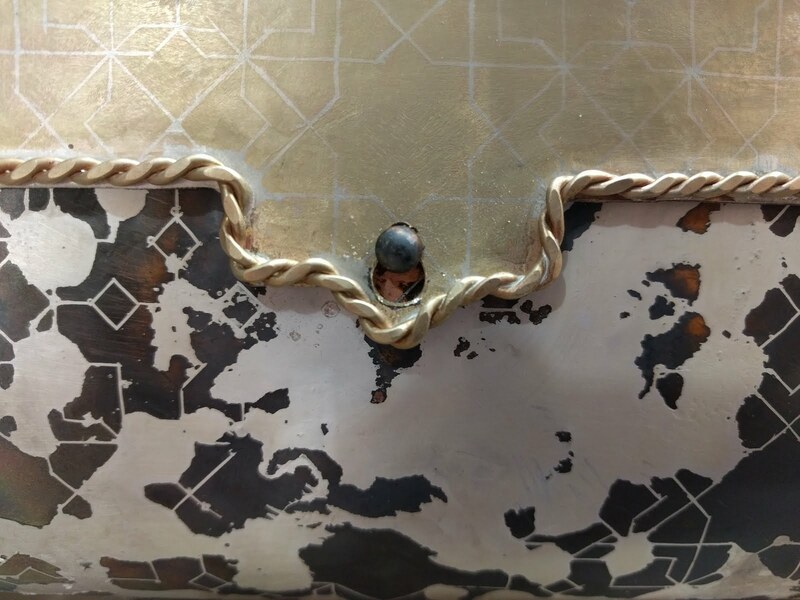 A smaller than planed piece of brass was cut to fill in the bottom segment of the bag, then more arabesque was transferred on and engraved. Doing it this way let me try to match up the edges of the panels for a less obvious seam. While I was waiting for the piece to pickle between soldering passes, I played with something else I haven't done before: hinges. My original plan was to use a modern jewelry technique where tubing is soldered onto the edges of the metal where the hinge goes. But, looking closer at the original, it looks like the hinges were formed by cutting square "teeth" and bending them back, based on the engraving on them and the lack of seams. 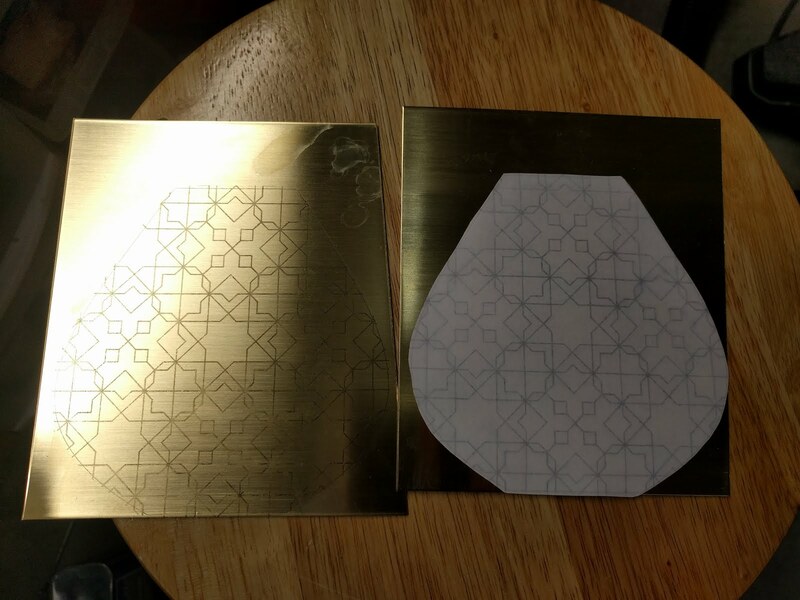 While I already cut my panels so I couldn't mirror that exactly, I could make hinges and solder them on the back in that style. 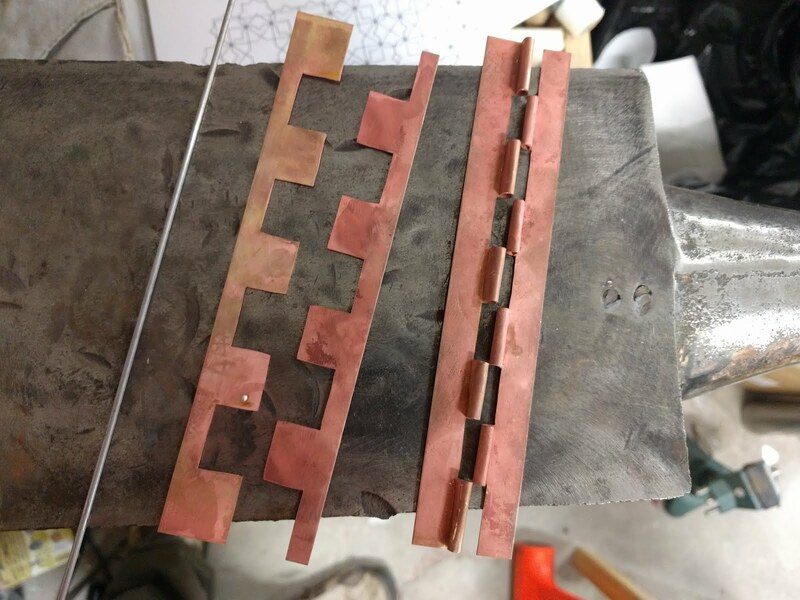 This also let me use 22 gauge metal for the hinge instead of the 18 I used for the panels, which is much easier to bend into the proper shape. Since doing all that soldering took a while, I also started in on the front flap. 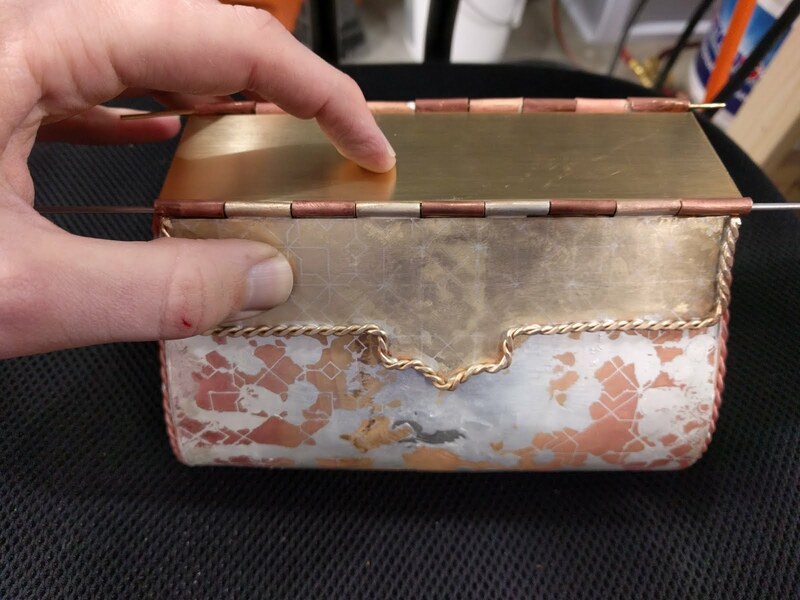 It was engraved and inlaid in the same fashion, then had half the hinge soldered on the back of the top edge. For decoration, I twisted some 14 gauge wire then gave it a few passes through the rolling mill to flatten the top surface and soldered it in place on the edges. 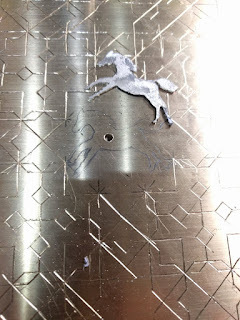 I actually sanded too far the first time and removed some engraving, so I got to do that whole step again. But, it worked out in the end, and better messing up on the flap than on one of the already soldered panels. 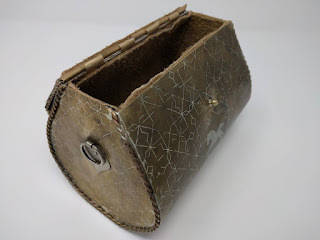 By this point, the body of the bag was soldered and also had wire decoration added, so I did some test fitting so I could start on the top panel. More engraving was done, solder inlaid, hinges attached, etc, etc. 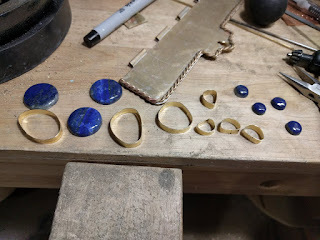 I skipped taking pictures of the lapidary, but some lapis cabs were cut and bezels were made. 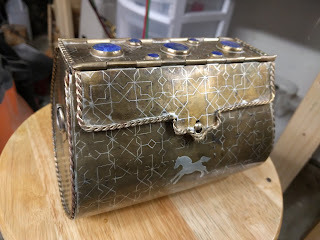 Once the top flap was done, I test fit the hinges so I could see how the flaps would hang and figure out where I should cut a hole in the front flap for the latch. There was just enough play in the flaps that I decided to do a post and eye for the latch. 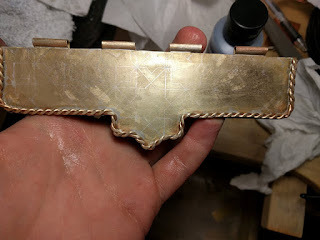 The original piece has a larger hole cut for what was likely a more standard loop, but doing it this way lets me preserve more of the engraving I spent so much time on (and keep the center mullet intact, since that is important to the heraldic badge motif). 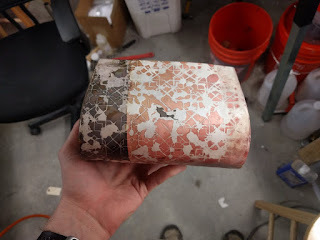 Finally, it was time to sand the body of the piece. 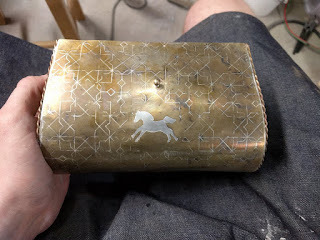 This took some time, since I didn't want to go too far and mess up more engraving. There were a few spots that lost detail, but I managed to stop myself and leave it at "good enough." 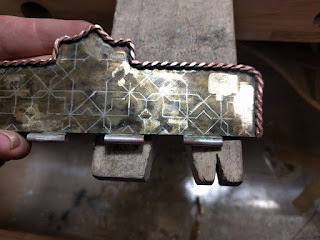 The whole thing got hit with a more controlled coat of Baldwin's patina to make the inlay stand out, then layered with paste wax. The hinges would up being easier to finish than I thought; instead of having a domed, rivet style end on the pin wire, I noticed the ends of the hinges were crimped which saved me some time. 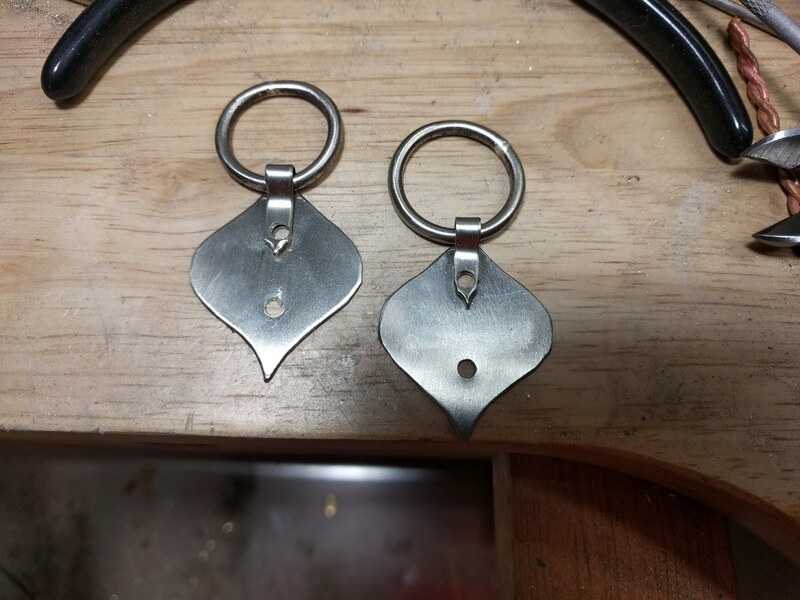 For the final piece, I needed to add rings onto the sides for a strap to attach to. 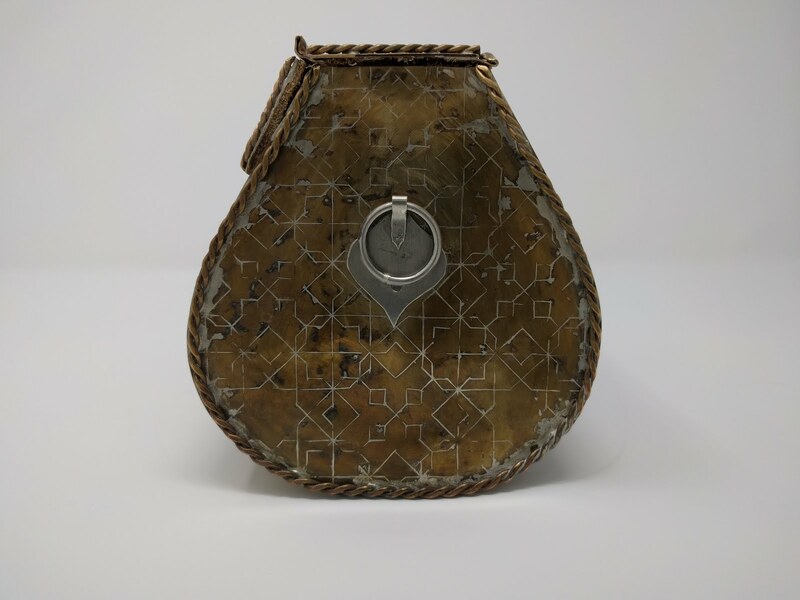 The original piece had spade shaped pieces holding the rings. But, that seemed to easy, so I burned an extra hour or two overthinking the design. I finally got myself to just make spades and call it good. I lined the inside with leather to both pad anything inside and prevent clanking. 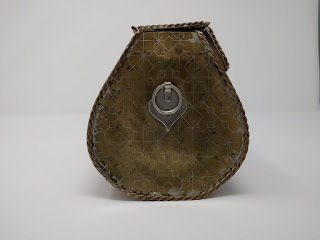 I used 8 oz leather, which was probably overkill, but it was what I had around from an old gorget project. Then, after spending three weeks in panic-crafting mode, Unslung Heroes got delayed due to weather so I had to sit on this for a month and restrain myself from trying to fix minor imperfections and risk messing up the whole piece. I got a lightbox, so I got to make my own museum-esque pictures. 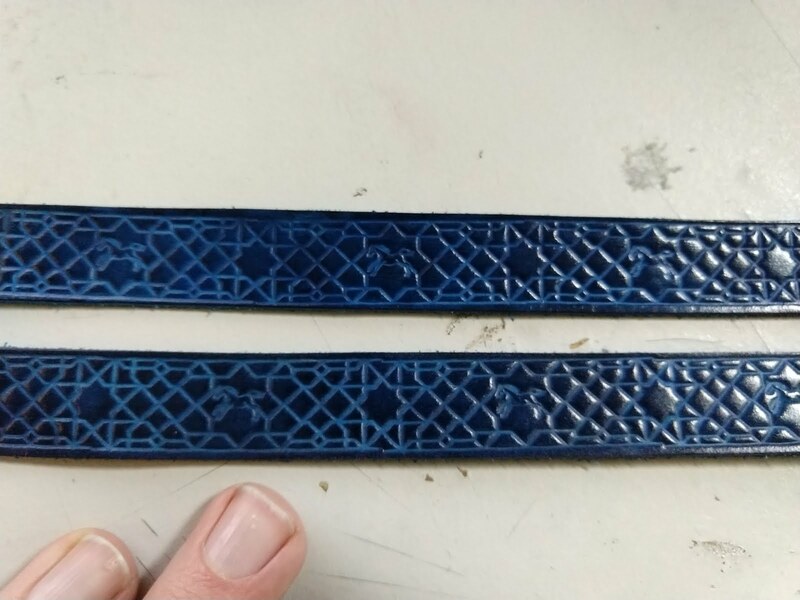 I went ahead and made a strap as well. 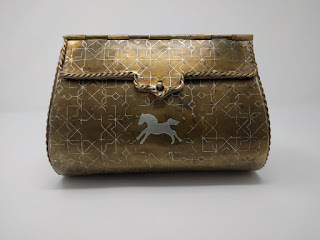 I was going to leave it to Ayisha to do that since there was going to be plenty of time before Valor and Lilies, but since Valor is now a week after Unslung, I decided to make the bag ready to use instead of giving her a last minute project. 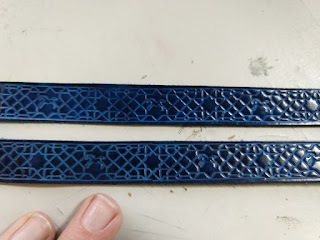 I was able to make a custom stamp to do the pattern. 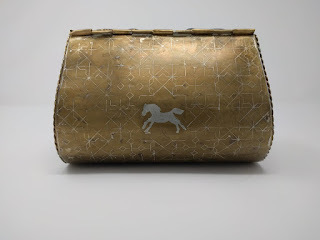 The strap is 3/4" wide and about 60" long with a buckle in the front to make adjustments. This was my first time writing doc. It brought back memories of high school and panic over slightly misformatting citations in MLA format. (Because if you forget a comma in the citation format on your works cited page, your citation is invalid. And invalid citations mean you plagiarized, which means you get a zero.) A PDF version is here. 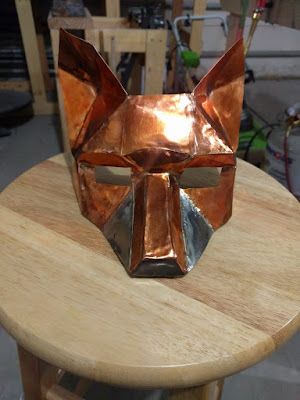 I've had the idea of making a metal fox mask for a few years now, but haven't really had a reason to do it until this year. Work decided our holiday party would be a murder mystery masquerade, which makes a great excuse. The basis for the mask was Wintercroft's Fox Half Mask. The half mask is perfect for the masquerade use, and I thought the papercraft/low poly look would translate well to the metal. I took the mask template and glued it to 22 gauge copper sheet with spray adhesive. Then after about an hour of work with a jeweler's saw... I had the pieces, somewhat resembling a fox mask, but mostly a Batman logo. The paper templates were attached to the other side, so I could use the dotted lines for initial bends. These were mostly done on the corner of an anvil or over a piece of 1"x4" clamped in a bench vice. A rubber mallet was used instead of a metal hammer, since the rubber won't leave indentions in the surface where the hammer strikes. Largesse was requested for the royal gift exchange at Gulf Wars 2018. Coming off making coronets, it felt like I had too much free time, so I volunteered for something metal. Calontir had Meridies, who's current royals were 12th century English and Anglo-Saxon. 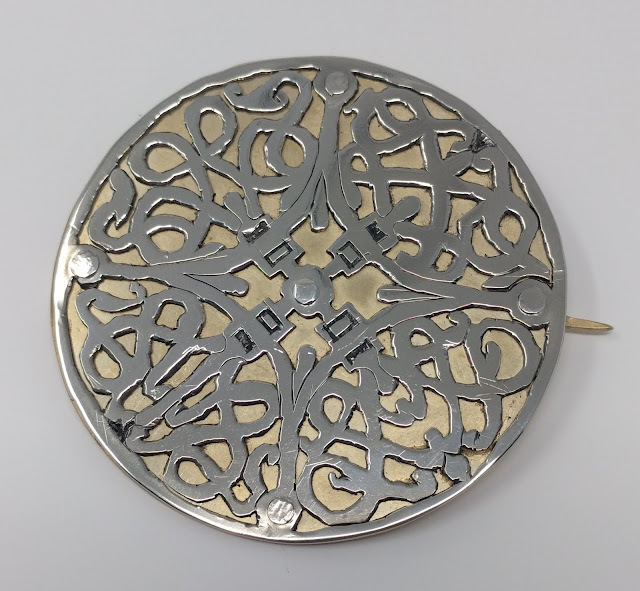 After spending some time looking around the British Museum collection, I decided on a disc brooch, based on this. DesignThe disc brooch appeared to be two layers riveted together at five points, with a pin riveted on the back along the line formed by three of the rivets. The museum lists the brooch as being made of gilded brass for the back and silver for the top, along with some niello (silver mixed with sulfur, creates a black inlay) in a cross pattern. There was a nice overhead shot provided by the museum, so I was able to play with it in GIMP and make a template for sawing out. After sawing it out, I had the pattern for the top in place, but the edges were square, while the extant piece had very beveled edges.